After introducing the High Temperature Performance (HTP) line of lubricants last year with the DOT 4 brake fluid, ATF fluid, and lithium grease, Petron is adding three more HTP products to its portfolio with gasoline and diesel HTP engine oils and gear oil. Engineered specially for Manila’s hot climate and stop-and-go traffic situations, Petron’s new line of HTP engine oils—the Petron Blaze Racing HTP and Petron Rev-X Turbo HTP have outstanding oxidation and thermal stability that protects an engine against wear-and-tear. Both are PAO-based fully-synthetic engine oils made with Infineum additives. Infineum, a UK-based company that specializes in petroleum additives says that thanks to additives exclusive to Petron HTP engine oils, both Petron Blaze Racing HTP and Petron Rev-X Turbo HTP promote longer engine life, longer oil change intervals, and give excellent engine protection against extreme driving conditions. The Petron Rev-X Turbo HTP, in particular, is designed with modern diesel engines in mind. It helps prevent soot and piston deposits and prolongs the life of emission control systems such as diesel particulate filters (DPF) and exhaust gas recirculation (EGR). Petron Blaze Racing HTP is available with a viscosity rating of 0W-40 and is approved and certified to pass APN SN, MB Approval 229.5, MB Approval 229.#, and Porsche A40 standards. Meanwhile, Petron Rev-X Turbo HTP has a viscosity rating of 5W-40 and is approved and licensed according to the specifications of API-CJ-4/SN, MAN 3575, Cummins CES 20081, MB Approval 228.31, Volvo VDS-4, and Mack EO-O Premium Plus. 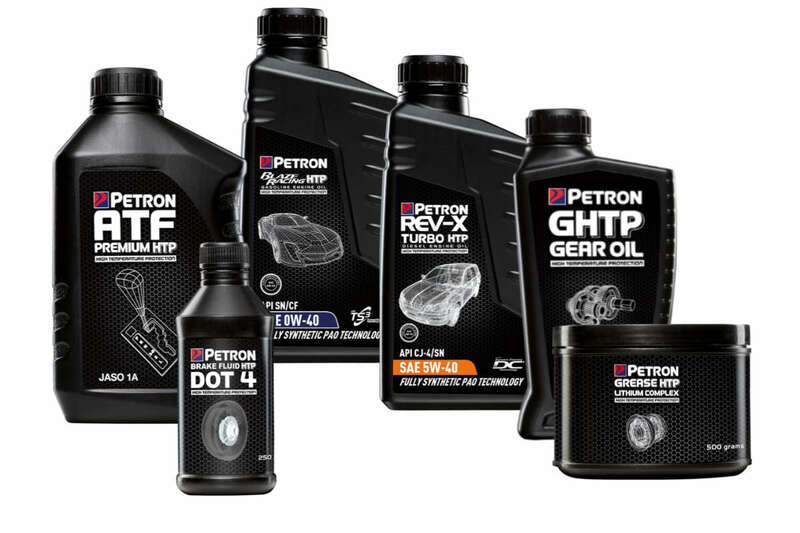 Complimenting this new line of engine oils, Petron also launched the Petron GHTP Gear Oil. Like the two engine oils, it’s a fully-synthetic premium-grade lubricant that’s formulated to meet the stringent requirements of automotive axles, limited slip differentials, and manual transmissions. It also offers excellent thermal and oxidation stability, is compatible with commonly-used seal materials, and has excellent water separability, and air releasing ability. It provides superior axle wear protection even at high temperature conditions, helping keep transmissions running smooth. The Petron GHTP Gear Oil has the performance profile of AP Service GL-5 and API MT-1. These three new additions to the High Temperature Protection line-up complements the three initial products: the Petron ATF Premium HTP—an automatic transmission fluid formulated for severe operating conditions and longer change intervals; the Petron Grease HTP—a heavy-duty, high-temperature grease, and the Petron Brake Fluid HTP—a DOT-4 standard brake fluid with a high boiling point and outstanding physical and chemical stability. The entire range of Petron HTP products is now available at Petron Car Care Centers and select Petron service stations nationwide. Can you post the link for your source that Rev x turbo htp is a PAO based Synthetic oil ? - Thanks ! Can you post the link for your source that Rev x turbo htp is a PAO based Synthetic oil ? Is it a group 3 or group 4 oil ? I cant find any info online. - DON Thanks !